So, without further delay, I began to do just that. A trusty knife and about an hour and I had skinned the stick, made a terrific mess and gotten a better feel for what I was doing. It was then that I noticed that the middle looked a bit like a snake. 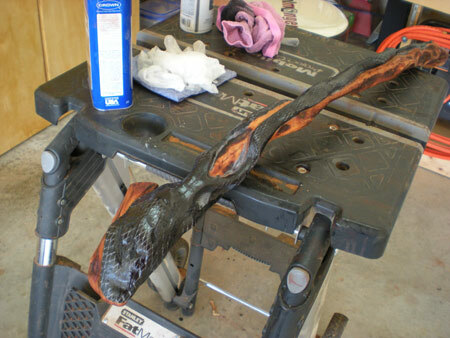 I thought I could probably pull a snake out of the wood if I was careful, so that’s exactly what I set about doing. A few more hours of finding my way with a chisel and a little Dremel work, and I made rough cutout of a snake tail and started to get excited about it. 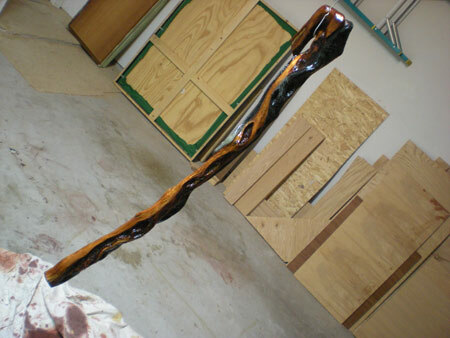 At this point I managed to forget what I was shooting for — a cane — and started making a snake on a stick instead. I’m pretty sure this isn’t how it’s supposed to be done, but screw it: I was having fun. 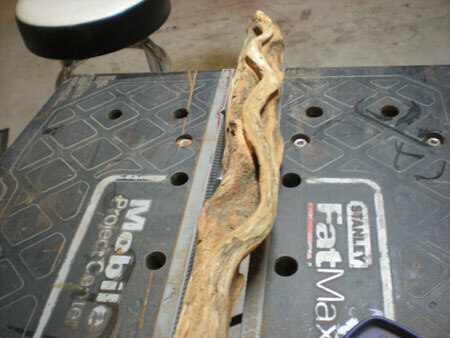 Next came the head, which involved a lot of shots with the chisel and a bit of cleanup with a Dremel. I was having so much fun in fact that the snake started growing more tails. 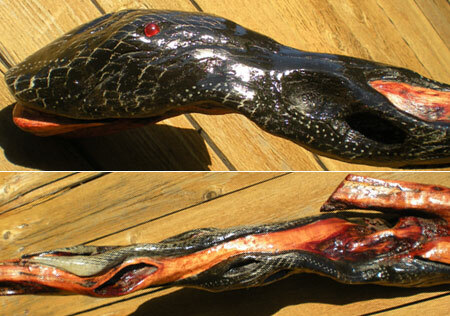 Before I quit that day my serpent was sporting three of them that wrapped around the stick. Since this is relief-style cutting I had to remove tons of material from around the tails to make them pop, which wound up taking off about a quarter of the stick’s actual remaining mass by the time I was done. Once happiness was achieved I slapped on some natural Danish oil to get the full effect. Most folks would call this the stopping point — I couldn’t bring myself to. Once it was “done” I kept thinking it was indeed very nice looking, but now all my carving effort is a little lost in the wood. What this project needed was paint — entirely unnecessary paint. So as long as the project was an experiment anyway I decided a few new painting techniques I’ve been itching to try would be just the thing, a little splotch of scales, some masking and voila — painted-demon-serpent thing. 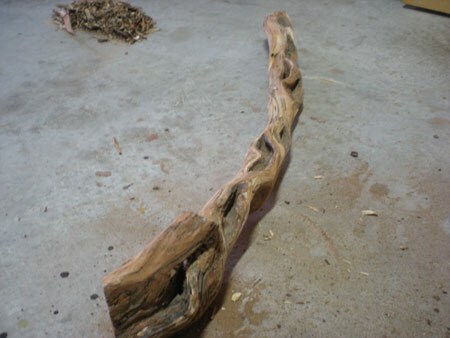 Dad gave me one more piece of advice before I left his place with my rough stick that turned out to come in very handy. I shall now dump that pearl on to you: “When in doubt, shellac the hell out of it and call it done.” That sounded like a great idea to me. I have no fantastic techniques to pass on, and no great mysteries of the secrets of carving were uncovered. 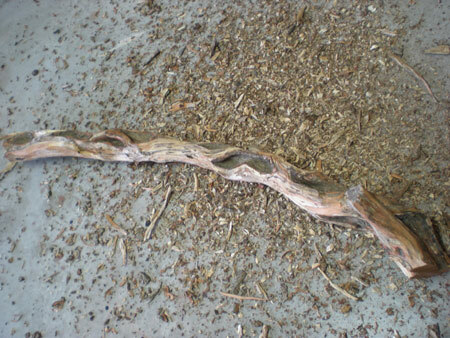 I took a perfectly good cane in the rough and turned it into rather a useless piece of wood with a very shiny demon snake thing carved into it. I can say I had a blast doing it and plan to butcher another hunk of wood in the same type of manner as soon as I can get my hands on one. Carving is a relatively cheap and very addictive way to spend time in the shop. There is most likely a right and wrong way to do it and I won’t insult real craftsman by calling myself a carver anytime soon, but as a first attempt I think it went great. I managed not to mutilate any valuable parts of my anatomy and came out the other end with something I enjoyed making — win. Nice piece of work. If you had fun perfect that’s what’s important. Btw have you checked out whittling? Nothing like a ball in a cage for a next project or a spoon. Keep those tools sharp and enjoy. The only thing I ever did was a ball-in-a-cage. The ball isn’t round, the cage isn’t square, I used a cheap crummy but sharp pocket knife and I did it to a hunk of 2×4 while I was sitting in the sun listening to a cassette player, no DVD back then, in the back yard instead of cutting the grass. THAT was a nice afternoon. Sean it looks great, Loved doing this is Boy Scouts, my scout master was an amazing carver, he had a walking stick….that he has many animals carved into. He just used an old Buck Knife. Nice shilelagh! Any Irish dapper would consider himself ready to go with your stick. 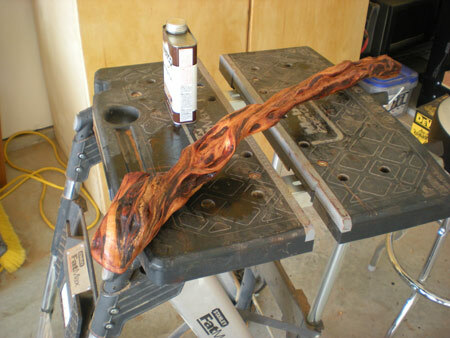 @Yadda, shilelagh… that is awesome! Never thought of that but that’s what I’m calling it from now on. I’m envious. I’ve always wanted a shilelagh. My Irish roots, I guess. That is an excellent talent it looks great the colors are very attractive.